North Korea conducted its fifth nuclear weapons test in September 2016, which was its strongest to date. At the same time, operations continue at the Yongbyon Nuclear Research Center, North Korea’s primary fissile material production facility. Pyongyang is producing both plutonium and highly enriched uranium (HEU) at Yongbyon, and is expanding operations there. Pyongyang is also enhancing its ballistic missile capability, and is in the final stages of developing an intercontinental ballistic missile that may be capable of reaching the United States mainland. These developments underscore North Korea’s determination to deploy a robust nuclear arsenal, with the capability of striking both regional and global targets. They also reflect the ineffectiveness of international sanctions to date in halting these efforts. North Korea conducted two nuclear tests in 2016. These were its fourth and fifth tests overall. Pyongyang claimed that the first test of 2016, conducted in January in Punggye-ri, was of a thermonuclear (hydrogen) bomb. The U.S. Director of National Intelligence (DNI) reported to Congress shortly after that test that the low-yield (6-10 kilotons) “is not consistent with a successful test” of a hydrogen bomb. However, another U.S. official familiar with the evidence told CNN that the device likely contained components associated with a hydrogen bomb. North Korea is also believed to have access to lithium-6 (Li-6), which is used to produce tritium in boosted and single-stage thermonuclear weapons. The second 2016 test was conducted in September, again at the Punggye-ri site. The yield was Pyongyang’s most powerful to date, with estimates ranging from 10-20 kilotons. Following the test, North Korea claimed that it had “standardized” its nuclear warheads, and is able to mount them onto ballistic missiles. Earlier nuclear tests were conducted in February 2013, May 2009, and October 2006. North Korea’s first two tests are believed to have been of plutonium-based devices. It is not known whether the later tests were of devices fueled with HEU or plutonium. Assessments of the current size of Pyongyang’s arsenal of nuclear warheads vary, due in large part to differences regarding the assumed amount of fissile material used per weapon. In any case, North Korea likely has had a stockpile of nuclear warheads for some time. In 2004, U.S. intelligence agencies reportedly assessed that it had anywhere from “possibly two to at least eight” nuclear warheads. Stockholm International Peace Research Institute (SIPRI) estimates that North Korea has approximately ten nuclear warheads. SIPRI further estimates that North Korea uses five kilograms (kg) of plutonium per warhead. These estimates were published in June 2016. Also in June 2016, the Institute for Science and International Security (ISIS) estimated that Pyongyang had 12-20 warheads, assuming two to four kg of plutonium per warhead and 15-25 kg of weapons grade HEU per warhead. The Nonproliferation Policy Education Center (NPEC) assessed in early 2016 that the warheads could number anywhere from four to over 20, assuming eight kg of plutonium per warhead and 25 kg of HEU per warhead. 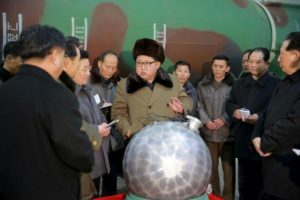 A Chinese nuclear expert associated with the China Institute of International Studies reportedly indicated in 2015 that North Korea may have as many as 20 warheads, and that it could double its arsenal within a year’s time. Estimates of North Korea’s stockpile of fissile material vary as well. The most recent estimate comes from the South Korean Ministry of Defense, which assesses that North Korea had 50 kg of plutonium as of the end of 2016, enough for 10 nuclear weapons. In two reports published in 2016, Dr. Siegfried S. Hecker, former director of Los Alamos National Laboratory, estimated North Korea to have 32 to 54 kg of plutonium and 300-400 kg of HEU. He also suggested that North Korea could be producing up to 150 kg of HEU annually if it is operating covert enrichment facilities covertly. In 2015, ISIS estimated North Korea’s separated plutonium stockpile at 30-34 kg and its HEU stockpile at between 100-240 kg. The International Panel on Fissile Materials (IPFM) estimated that Pyongyang has produced approximately 30 kg of separated plutonium by the end of 2014, and assesses that the enrichment facility at Yongbyon is capable of producing HEU. North Korean leader King Jong Un announced in March 2016 that his country successfully developed a miniaturized nuclear warhead capable of being mounted on a ballistic missile. That month, North Korean state media also released images of Kim inspecting what is believed to be a mock-up of a miniaturized warhead. Washington is skeptical of Pyongyang’s miniaturization claims. Still, the head of North American Aerospace Defense Command (NORAD) informed Congress in March 2016 that “it’s the prudent decision on my part to assume that [North Korea] has the capability to…miniaturize a nuclear weapon and put it on an ICBM.” South Korea reportedly assesses that it will take several years before Pyongyang masters miniaturization technology. Currently, North Korea’s longest-range deployed ballistic missile is the Nodong. With a maximum range of 1,250-1,300 km (approximately 775-800 miles), the Nodong is capable of reaching all of South Korea and parts of Japan. The Yongbyon Nuclear Research Center, located approximately 90 km (54 miles) north of Pyongyang, is North Korea’s main nuclear complex. It houses all of its key (known) facilities, including its plutonium production reactor, reprocessing center, and enrichment plant. Yongbyon will remain a reliable source of both the plutonium and HEU North Korea needs to expand its nuclear arsenal. The 5 MW(e) reactor is producing recoverable plutonium, the reprocessing facility is functioning, and the enrichment facility is online. 5 MW(e) Experimental Nuclear Power Plant: a graphite-moderated reactor. This reactor has been in operation since 1986 and provides North Korea with a source of plutonium. It was shut down between 2007 and 2013. In April 2013, North Korea announced that it would restart the reactor, which appears to have operated intermittently since then. According to the International Atomic Energy Agency (IAEA), the reactor appeared to be shut down from October to December of 2015, likely to remove spent fuel for reprocessing. Radiochemical Laboratory: a reprocessing facility, where plutonium and uranium are extracted from irradiated (spent) nuclear fuel. It has a production capacity of 100-150 tons of heavy metal per year. North Korea reprocessed 8,000 spent fuel rods here after expelling international inspectors in 2009. According to the IAEA, the facility appeared to be operating from early 2016 to July 2016. ISIS estimates that North Korea separated approximately 5.5 – 8 kg of plutonium during this time, enough for approximately 1 – 4 additional nuclear weapons. In August 2016, an official from North Korea’s Atomic Energy Institute claimed that Pyongyang had resumed spent fuel reprocessing. Uranium Enrichment Plant: reportedly contains 2,000 centrifuges in six cascades with an enrichment capacity of 8,000 kg seperative work units (SWU) per year. The DNI assessed in 2014 that North Korea was expanding this facility, an assessment confirmed by satellite imagery. According to a 2014 report, North Korea may be adding as many as 2,000 centrifuges, thus doubling its enrichment capacity. In August 2016, an official from North Korea’s Atomic Energy Institute claimed that Pyongyang was producing HEU. The IAEA has stated that the enrichment facility appears to be in operation. Nuclear Fuel Fabrication Plant: used to convert uranium oxide (U3O8 or “yellowcake”) into uranium metal, and has housed uranium dioxide (UO2) powder, fuel rods, and fuel rod cores. Light-water reactor (under construction): reportedly has a capacity of 100 MW(th) (25 to 30 MW(e)). In its August 2012 safeguards report, the IAEA indicated that North Korea had made “significant progress” in the construction of the light water reactor at Yongbyon. The facility was reportedly still under construction as of August 2016. Nuclear fuel rod storage facility. North Korea has two known uranium mines: Wolbisan and Pyongsan. In addition, it has two known uranium mills: Pakchon Uranium Concentrate Plant and Pyongsan Uranium Concentrate Plant. The IAEA has not visited these sites since 1992, relying on satellite imagery to monitor activity there. Satellite imagery analysis by private experts has concluded that the Pyongsan mill is undergoing “significant refurbishment,” suggesting that North Korea plans to mine and mill a “significant amount” of uranium from the Pyongsan mine and possibly other locations. North Korea withdrew from the Nuclear Nonproliferation Treaty (NPT) in 2003, and expelled international inspectors from the country in 2009, after the collapse of the six party talks. In response to Pyongyang’s refusal to cease its nuclear and ballistic missile programs, the international community has imposed sanctions. After the first nuclear test in 2006, the U.N. Security Council adopted resolution 1718. Among other measures, the resolution prohibits the import to or export from North Korea of battle tanks, heavy artillery, combat aircraft systems, warships, items applicable to its nuclear or ballistic missile programs, and luxury goods. After each subsequent test, the Security Council adopted additional sanctions, further restricting North Korea’s access to sensitive or restricted materials and technology, and to the global economy. The Security Council enacted additional sanctions against North Korea in response to each of the two tests conducted in 2016, further restricting access to the international banking system, the shipping sector, and to dual-use and luxury items. Resolution 2270 (March 2016) requires the inspection of all cargo going to or coming from North Korea or being shipped by a North Korean national, and imposes other prohibitions on North Korean vessels and aircraft. Resolution 2321 (November 2016) places a cap on North Korea’s annual coal exports, in addition to other measures. Pyongyang reportedly collects over $1 billion annually from its exports of coal—its largest source of revenue. Much of this money is funneled into its nuclear and ballistic missile programs. The Security Council resolutions also impose restrictive measures, including an asset freeze, transaction prohibition, and travel ban, against designated organizations and individuals connected to North Korea’s nuclear, missile, and military programs. To date, 39 individuals and 42 organizations have been designated by the Security Council. These measures have targeted some of the main entities in charge of North Korea’s nuclear program. For example, the Ministry of Atomic Energy Industry (aka General Bureau of Atomic Energy*), which was designated in 2009, oversees North Korea’s nuclear program, including activities at Yongbyon. In 2013, it was put in charge of modernizing the country’s atomic energy industry. It is currently in charge of the day-to-day operations of the nuclear weapons program and oversees a number of nuclear-related organizations and research centers. Another entity, the Munitions Industry Department (MID), which was designated in 2016, oversees North Korea’s weapons production and R&D programs. MID planned and prepared the January 2016 nuclear warhead test. According to a 2010 UN Panel of Experts on North Korea report, it has also been involved in overseeing operations at Yongbyon. The Security Council has also designated producers of machinery and components for the nuclear program. One such entity is Korea Ryonha Machinery Joint Venture Corporation, which was targeted in 2013. Ryonha is North Korea’s primary producer of computer numerically controlled (CNC) machines, including multi-axis CNC machines, which are important for the production of nuclear weapons. Another production entity designated by the Security Council is Korea Hyoksin Trading Corporation. Hyoksin, which was targeted in 2009, is involved in the development of unconventional weapons. It produces electronics and instruments for measuring and testing. Other entities supporting North Korea’s nuclear program have not been designated. One example is Kim Chaek University of Technology. This institute produces concentrated nitric acid (CNA)- resistant low-carbon stainless steel, which is used in plutonium extraction equipment and spent fuel storage vessels. The University has also trained personnel at Yongbyon. In recent months, individual countries have sought to increase pressure on Pyongyang and to enforce the sanctions already in place. The United States, Japan, and South Korea implemented another round of autonomous sanctions shortly after the passing of Resolution 2321. Also, in November 2016, the U.S. Treasury Department issued new regulations designed to prevent North Korean banks from accessing the U.S. financial system covertly through correspondent accounts in the United States and other countries. And a number of governments have reportedly either suspended or restricted trade with North Korea in response to international sanctions. These autonomous measures, combined with Security Council resolutions, restrict North Korea’s access to foreign goods and currency. However, the sanctions regime has failed to change Pyongyang’s behavior or sufficiently hinder its activities abroad, a situation highlighted by the U.N. Panel of Experts. In its latest report from February 2017, the Panel indicates that, despite the strength of existing measures, Pyongyang has still managed to effectively evade sanctions, trade in restricted items, and access the international banking system. North Korea is able to conduct illicit activities due to its sophisticated evasion methods as well as the “insufficient and highly inconsistent” sanctions implementation by U.N. member states. North Korea uses shell companies all over the world to procure sensitive material for its nuclear program and other programs of concern. This evasion technique is regularly employed by North Korea’s shipping sector. In 2014, Pyongyang’s Ocean Maritime Management Company (OMM) was designated by the Security Council for its role in an illicit shipment of weapons from Cuba to North Korea. Prior to its designation, OMM was one of North Korea’s largest shipping companies. Since then, it has transferred control of its fleet to an elaborate network of front companies scattered around the world, and has also renamed most of its vessels in an attempt to circumvent international sanctions. North Korea is also believed to use embedded agents in foreign companies and diplomatic personnel in order to trade in prohibited items. In addition, North Korean state trading companies based in China are reportedly an important channel for Pyongyang to smuggle sensitive equipment and materials. These companies are believed to operate in partnership with private Chinese companies, with many of the larger ventures operating inside of China. In recent years, a number of Taiwanese companies have also exported sensitive equipment to North Korea, including CNC machine tools, a horizontal machining center, advanced industrial computers, and stainless steel tubes. The Chinese government’s weak enforcement of U.N. sanctions has allowed North Korea’s procurement networks to operate. The New York Times reported in March 2016 that many of the new restrictions against North Korea, including the requirement to inspect all of its cargo, are largely ignored in the Chinese border city of Dandong, through which approximately half of China’s trade with North Korea flows. The report adds that North Korean procurement officials operate freely in the city. North Korean banks play an important role in the evasion of sanctions, processing payments for illegal transactions and blacklisted end users. One such institution is Daedong Credit Bank, which was designated by the Security Council in 2016. Daedong held over $25 million in Macau-based Banco Delta Asia for financing North Korea’s nuclear weapons program, illicitly gained through narcotics sales and counterfeiting. Another institution is the Korea Kwangsong Banking Corporation, which was also designated by the Security Council in 2016. Kwangson has provided financial services to U.N.-sanctioned entities connected to North Korea’s unconventional weapons programs. And Pyongyang’s Foreign Trade Bank has been used to facilitate transactions on behalf of entities linked to North Korea’s proliferation network. In response to such activities, Resolutions 2270 and 2321 restrict the ability of North Korea’s banks to operate abroad. How effective these restrictions are remains to be seen. North Korea’s most well-known nuclear client is Syria. Until 2007, Pyongyang was helping Damascus build the Al Kibar nuclear reactor, a covert facility in Dair Alzour, which was to be used for producing plutonium. This assistance came to a halt in September of that year, when Israeli fighters destroyed the facility. Unconfirmed reports indicate that North Korea also supplied Syria with 45 tons of yellowcake for Al Kibar, enough for 89 to 130 kilograms of weapons grade HEU upon further processing and enrichment. North Korea’s involvement in nuclear activities in other countries is less clear, but it remains willing to export its expertise and technology. In 2016, a North Korean company posted an advertisement online for the sale of Lithium-6. In addition, according to some reports, Iranian scientists were present to observe North Korea’s 2013 nuclear test. The steady progress North Korea is making in its nuclear program is a testament to the determination of its government and the success of its illicit procurement networks. The latest round of U.N. sanctions has the potential to disrupt these efforts. However, this potential can only be realized if the sanctions are strictly enforced by U.N. member states, especially China. * The MAEI and GBAE are sanctioned as separate entities by the UN Security Council and the US Treasury Department. Here they are treated as the same entity, per the recommendation of the UN Panel of Experts in its 2015 report.